Bed bugs symptoms are most important to identify if you're suspicious of having bitten by any of them. These tiny bloodsuckers will make your life disgruntled! The first step in determining if you have them is to identify the insect. For inspecting them, there are always certain symptoms we should look to identify when looking for these parasites. Let us take a few minutes to learn how to identify the common symptoms. First of all, we need to identify the frequency of the bug bites. If you're bitten just once or randomly few times it is not a concern of bed bugs as it may be any other insect which may have bitten you just in case you were asleep. So you need not worry about the bed bugs at all. 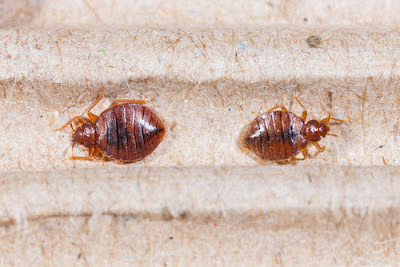 But if you are getting bitten all of the time when you sleep, then there is a great chance that you have a bed bug infestation. Bed bugs are very habitual insects. Once these find a spot to feed, they make it a habit to visit it every night to get their dinner. So the one bug brings the others too for dinner. Now you would be curious to know how the bed bugs sense the humans. Well, they sense the carbon dioxide which we exhale. We exhale more carbon dioxide during our sleep hence they are attracted at night. These are hence the nocturnal insects which come out at nights. You wake up in the morning with bites all over your body and you become curious to spot them out, but they may not be visible during the day. In the beginning stages of the infestation, you may not see any symptoms. They usually hide in clefts and dark places such as under the carpet, behind walls, under floors, and other places where you cannot see them. But as the infestation grows, it becomes much easier to see symptoms during the day. Another symptom of bed bugs is the location of the bites your body. The signs become clear that it's them when you find the bites on your upper half of the body. 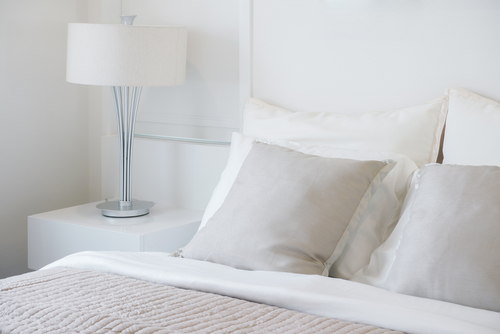 In some instances, people with a flea infestation may stumble upon mistaking flea bites for bed bugs bites. But you can differentiate Flea bites with that of bed bug bites in that the Flea bites are more likely to occur on your legs, while the bites on your back and arms could be fleas or more commonly the bed bugs. Various other symptoms which are more characteristic of the bed bug and more pronounced are Presence of large wheels which slowly reduce to a red mark and then gradually fade over a few days. Feeling Itchiness. Reddening of the skin. Persistent Localized swelling. Formation of Blisters around the bites. Wear and tear of tissue around the site of bite In case you find the bite marks but unable to spot out the right insect or if you are not sure about the presence of bed bugs around you, here are some of the ways to help you out. A thorough examination of the surroundings as these bugs hides in clefts and crevices them being nocturnal. If there are any small bloodstains from crushed bugs on the bedding. Sometimes dark spots of the excreta of the bed bug can be found on the mattress hence you can confirm them. Their scent glands secrete sweet, musty, offensive odor which may help in spotting them out. How many times in your life have you heard that little phrase? When you were a child, did you wrap yourself up in a cocoon so those little terrors wouldn't get to your precious skin? Did you ever wonder where that seemingly simple saying came from? Well, it's time you had your questions answered. Today is the day you find out how bed bugs get around and infest the things you own. These bugs don't move around all that often. They only "pack up camp" when food becomes hard to find, or meals are too far in between. However, when they do get ready to go, they do it with surprising effectiveness. They only move around at night when humans are asleep. Also, their small, flexible bodies can fit into small places. They move across pipes and boards quickly. These insects can make their home in many different kinds of building. They are often found in moving vehicles, furniture rental stores, homeless shelters, and our homes. They're so small that they can hide in almost anything and you wouldn't be much the wiser. They can even make their homes in your clothing without you noticing. If you're wondering how these bugs get into your house at all, you're in for a long list. The simple fact of the matter is that almost anything you bring past your threshold can be infested with these vermin. Furniture you buy or rent, clothing, stuffed animals and even wooden items such as kitchen tables or brand new doors can hold these creatures. Bed bugs are known to travel over lines and piping so they could even come from your next door neighbor or from a package you accept from a mail truck. Some people get bitten by these bugs and don't even realize it! Researchers have decided that bed bugs prefer to hide in materials made of wood or fabric. Even so, they seem to be more than willing to expand beyond that if they need to. They can hide in dust, clutter, and shredded paper just as long as they are close to a food supply, usually a bedroom or frequently used living area. Because they are so fickle when it comes to their nesting grounds, it can be hard to locate and stop these bugs unless they become concentrated. Unlike ants or spiders they are prone to moving around. They like to stay where the food is, and if you switch the room you sleep in, you ultimately switch which room they live in. Ultimately, bed bugs are a tough bug to crack, so to speak. They're small, smart, and adept at avoiding detection. Hopefully, now that you know how bed bugs get around you'll be better able to beat them at their own game.